As the season of goodwill approaches, join me on a journey to unwrap the true meaning of Christmas, and to learn how to celebrate consciously and compassionately this year. I love the magic of Chirstmas: for the gift of togetherness it brings, the wonderment of children and the feeling of goodwill that embodies the season. What’s not to love about sharing warm mince pies and mulled wine with loved ones around a blazing log fire. I do however cringe at what Christmas has become; an excessive barrage of over-consumption and materialism, which has a draining effect upon the bank balance and the planet. The true reasons for the season have become buried under a mountain of consumer-driven insanity, fuelled by an economic system dependent on constant growth. One that ignores the fact that we are consuming our planet to extinction and for this reason the advent of Christmas brings conflicting feelings for me. Not wanting to be a bar-humbuger, or to compromise on the cheer, I knew I had to reconcile my festive feelings. I had to find what Christmas truly means for me, and to discover a way of celebrating with minimum impact upon the planet and maximum enjoyment for all. Fortunately I discovered that Christmas doesn’t have to cost the earth, for neither our pockets or the planet. So I share what I’ve learned in the hope that it may inspire you to enjoy a kinder, greener Christmas this year. Although the world celebrates Christmas as a ‘Christian’ holiday, its roots can be traced as far back at ancient Egyptian times. It is pretty much common knowledge that Jesus was not born on December 25th, and that the holiday of Christmas as we know it today, was adapted from pagan festivals of Winter Solstice (also known as Yule). Even Pope Benedict XVI admitted that the Christian calendar was wrong and that Jesus’ birth date is an unknown. Was born on 25th December to the virgin Isis-Meri. A star in the East accompanied his birth. Three Kings followed the star to reach the newborn ‘savoir’. He performed miracles such as healing the sick, raising the dead, and walking on water. After being betrayed, Hours was crucified, buried for three days and resurrected. These attributes permeate many cultures of the ancient world with numerous Gods subscribing to this general mythological structure. Other examples include Krishna of India, Dionysus of Greece, and Mithra of Persia, to name but a few. Every December 24th Sirius aligns with three stars of Orion’s belt, also known as ‘The Three Kings’. Mary represents the constellation Virgo also called Virgo the virgin (in Latin). On December 25 the Sun begins to move higher in the sky until it reaches its peak at the summer solstice. On this day (25 Dec) a newborn ‘Sun’ was born, which was humanised into the ‘son’ of God, ie. Jesus. So it seems the Jesus story comes from a number of allegorical myths that originated from astrology, and paganism. Traditions that personified the Sun and stars as divine objects, revered for providing sustenance and life. This is why we celebrate with candles and fairy lights – to symbolise the increasing light of the sun. In knowing these natural roots, we can chose to celebrate authentically and with respect for nature, from which it originated. When we learn that Christmas is all about reverence of nature, we no longer wish to participate in celebrations that contradict such teachings. Honour the Sun by watching the sunrise or set. Light candles or fairy lights symbolising the increasing light. 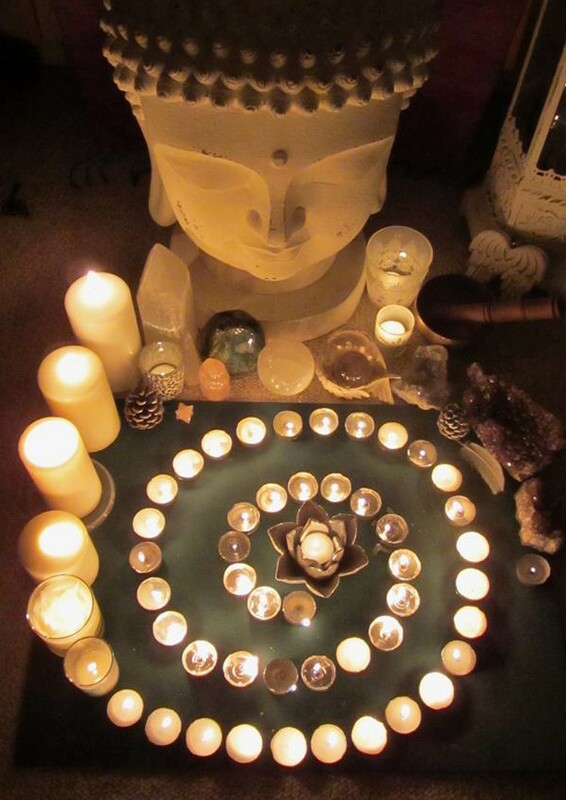 Last year I performed a spiral candle ritual (see here) to represent the journey of returning light (see picture). As I inwardly journeyed into the centre, I released what no longer serves me, before setting intentions for the coming year with each candle that was lit. Light a Yule log to lighten up long winter nights. Druids began this tradition to conquer the darkness, banish dark spirits and bring luck for the coming year. Gather loved ones around an open fire to celebrate together. Since the true meaning reflects a reverence for nature, spend time walking in the countryside, grounding, being mindful and thankful for nature’s wonders. With a little effort and imagination, we can reduce the environmental impact of the holiday season. When I consider the disposable culture of Western festivities, I am saddened by the grave impact they have upon our ecology. What is it about Christmas that leads us to consume and waste with such abandon? 226,800 miles of wrapping paper, which is enough to stretch nine times around the world. Millions of mobile phones, laptops, tablets, toys, digital cameras and other electronic devices bought for Christmas are destined to create a flood of dangerous e-waste that is being dumped illegally in developing countries, where toxic materials contaminate the land, water and the air. Waste aside, think of the resources used to manufacture your gifts, and transport them to the stores and then on to homes. With a surge in internet sales from abroad, most of the carbon footprint comes from the delivery alone. It’s not just the environment that suffers, people in developing countries are deprived of clean water and air due to factory pollutants, all because they produce the stuff we don’t need but feel pressured into buying. Many of today’s ‘must-have’ toys will most likely have been made in Third World sweatshops with no regard for the workers or for pollution. According to Animal Aid, Christmas see’s the demise of over 10 million turkeys each year in the UK alone, who are mainly reared in inhumane factory farms with no quality of life. For millions of animals, Christmas celebrations are the cause of considerable cruelty. It’s not just turkeys though – millions of pigs, geese and ducks also suffer in a time of supposed peace and goodwill. The situation sounds dire, but the solution is clear. Reduce the Western world’s compulsion to consume, educate people about the real cost of unnecessary Christmas spending and to encourage others to go green next Christmas. We can each make a difference by considering whether our actions contribute to the planets demise or longevity. In opting for a ‘stuff’-free holiday and by being the living embodiment of LOVE in action, we will inspire others and pave the way for a greener future. Christmas doesn’t have to be a burden on the environment, on your pocket, or your spirit. Here’s my 3-step guide to celebrating the season sustainably, in the spirit of PEACE and LOVE, which at its core is what it’s all about. Unless your gift fills a practical need and needs to be bought new, then why not give the gift of experience. I love giving gift-vouchers for massages, theatre trips and meals out, and people seem to cherish the memory of an experience far greater than acquiring more stuff. Stuck for ideas? Visit www.presencenotpresents.org, a fantastic online directory of experience gifts and charity gifts for all. Homemade gifts make thoughtful gifts, such as baking, arts and crafts. Aside from being far more personal, who actually needs the seventh pair of novelty Xmas socks bought for the sake of giving! Buy locally produced, organic and ecological goods where possible. By ensuring our money goes to independent businesses instead of multinational companies, we boost local economies and support real people. Since it’s the season of goodwill, you may consider giving the money you would spend on presents to charity or a worthy cause. Many charities, including Oxfam, are offering the chance to buy livestock for communities in developing countries, fund school dinners, or plant trees. (oxfamunwrapped.com). Through the World Wildlife Fund you can adopt a range of endangered species including orang-utans and pandas (www.wwf.org.uk/adoption). If money’s tight you could give IOU’s for your skills cooking, massage, chores, babysitting etc. and remember…. Choose recyclable paper gift-wrap over non-recyclable varieties. Recycle your cards, or re-use as gift tags the following year. Buy British, as many of today’s ‘must-have’ toys will most likely have been made in Third World sweatshops with no regard for the workers or for pollution. The added benefit is in boosting our own economy. Christmas is a time when over-indulgence and excess is not only the social norm, but is actively encouraged. As a health conscious person, I’ve come to realise it doesn’t have to be that way and with a little imagination, you can enjoy a delicious feast without harming the planet. As a vegetarian my Christmas dinner comprises of an organic nut roast, but for the meat eaters; unless you buy a free-range organic animal, your Christmas dinner will have been reared in intensive factory farms with all the horrors that brings. Instead, buy locally at farmers markets (find your nearest one at www.farmersmarkets.net). You will reap the benefits from chemical-free food, the reduction in food miles and CO2 emissions. It also helps save the bees which are in rapid decline, partly due to the chemicalization of agriculture. Consider avoiding the plastic-not-so-fantastic disposable decorations this year and let nature decorate your home instead. Try homemade natural decorations. Holly, berries and ivy draped over picture frames and mantelpieces are the perfect alternative to the non-biodegradable plastic tat. The internet provides a wealth of inspiration for natural Christmas crafts using drift-wood, pine cones, dried oranges, cinnamon sticks and seasonal foliage. Christmas Tree: Spare a thought for the 8 million real trees sold each year for Christmas in the UK. Why not choose a living Christmas tree instead, skipping the annual tree cull, and avoiding the consumerist production and disposal that is involved in both plastic and cut trees. Simply re-plant each year, or grow your own tree. The added bonus is in knowing that your live tree will produce oxygen to help the planet. If you do opt for a real tree, ensure to recycle it for composting and wood chipping. Have a look on www.recyclenow.com and use the postcode locator to find a tree recycling drop off point near you. In remembering the true spirit of Christmas, we can ensure this year’s festive celebrations reflect these core values of love, simplicity and reverence for nature. Sure it may take a little more imagination and re-adjustment, but adopting earth-friendly practices definitely represents the spirit of giving that characterises this season. After all, extending goodwill to our planet will help ensure its survival, and in turn our own. Each and every one of us can make a difference if we chose to BE the change, paving the way towards a better world for all. This may be an old post, but definitely a relevant one. I used to manage a charity shop and I was so overwhelmed by the sheer amount of stuff people would buy each other at Christmas, donate in the run up to Christmas to make way for new stuff, and then they would donate in January everything they didn’t really want. Bad for business, but I always used to hope people would do other things than buy each other stuff, like spend time with each other, or volunteer or reconnect with family or neighbours, or anything that represents the true spirit of Christmas instead of buy stuff! That’s why I started my own business http://www.presencenotpresents.org I would be honoured if you could take a look and maybe include a link in your article if you like what I do.